SPOILER ALERT: This review may contain spoilers. Marvel’s “Daredevil” returned to the small screen Friday, releasing the series’ third season and the 11th season to come from the Marvel-Netflix partnership. The series follows Matt Murdock, a New York City attorney who was blinded in a childhood accident. His remaining senses are raised to superhuman levels, allowing him to fight crime as a vigilante known as Daredevil. Season 3 picks up almost immediately after the end of “The Defenders,” Marvel’s team-up franchise featuring all its Netflix heroes. The finale of “The Defenders” featured Murdock getting crushed to death after sacrificing himself to destroy a villain’s headquarters, only to wake up bloodied and injured under the care of nuns. From the very first teaser, a visually stunning 53-second video posted Sept. 20, Season 3 seemed poised to take the franchise in a bold new direction, stylistically speaking, while also keeping true to the series’ core themes of personal conflict, inner demons and the struggles of maintaining a double life. Ultimately, it managed to deliver on both of these fronts, with powerful visual storytelling driving an interesting narrative surrounding Murdock trying — and ultimately failing — to cut out his civilian life completely. However, it also regularly stumbles on its character writing and fight choreography, losing much of the nuance that made the series’ previous seasons, especially its first, so great. Loss of nuance is really the phrase to describe the vast majority of this season’s problems. 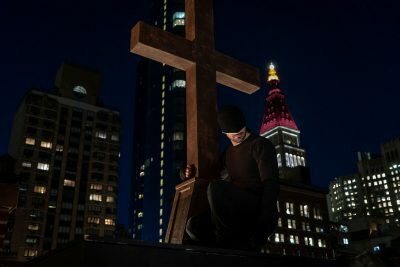 While prior seasons showed Murdock’s inner conflict and struggle with being Daredevil through the character’s actions and dialogue, this season takes us directly into the mind of Murdock. Using vivid hallucination scenes, he discusses his issues with important individuals from his past. The scenes, while beautifully directed, do very little to help move the story forward or reveal more about the characters. Much of this loss of nuance seems to come from the core conceit of this season. Previous seasons followed a Murdock who had not only a fulfilling personal life, but also close relationships with other characters. The conflict within him could therefore be easily shown through how he acted in his personal life. For instance, he abandoned social and professional engagements to go fight crime. His friends were often able to spot inconsistencies in his judgement that came from being both an attorney dedicated to his Catholic religion and a masked vigilante who regularly beats people to the point of hospitalization. In this season, however, Murdock is largely alone, having taken advantage of his supposed death to cut out his civilian persona. Because of this, he can’t act off of other characters in the same way he once did. The few interactions he has with his former friends are largely marred by the betrayal and disgust one would expect from an individual who recently learned their dead friend is not only alive, but has been hiding this fact from them for a number of months. As such, the show is forced to rely on more heavy-handed tactics to show Murdock’s internal strife, which continues to be a core theme of the show. On the topic of heavy-handedness, the amount of emphasis the writers put on Murdock’s fall from religion and new lack of faith in God is almost nauseating, at least in the first few episodes of Season 3. While increased emphasis on Murdock’s faith is understandable — given that he is now operating out of a church basement and is being cared for by nuns — the way Murdock now discusses his faith in light of his recent struggles has changed from an interesting aspect of his moral philosophy to an excuse for the character to bemoan his situation. He regularly discusses how he feels God is “punishing” him and how he feels he has now seen God’s “true face,” at one point going on a long rant that features an analogy to the biblical story of Job. It’s so overextended, even the nuns make sarcastic comments about it. The storytelling isn’t the only thing that has suffered. The fight scenes, once praised as a high point of the series, with the notorious “hallway fight” even becoming momentarily famous, have also lost much of their nuance. They’ve fallen into standard Hollywood tropes of armbars and one-hit knockouts over the kinetic, gritty and hyper-realistic style the franchise once employed. The fights are still entertaining, but they lack the magic they once had. Ultimately, Daredevil’s third season leaves a lot to be desired for fans looking for the same thrill as the first two seasons. The fight scenes, storytelling and moral philosophy have all lost much of what gave the first two seasons their distinct style. However, the season is able to make up for most, but not all, of this with exciting visual direction and an engaging plot. This season seems to still fall short of its predecessors, but not by much. Despite this, fans are sure to still have an excellent time with it.